Bob Campbell's story begins in 1942, just before his graduation from Melrose High School in Melrose, MA. He was considered a good football player in high school. That's why, one day in June 1942, his football coach stopped him in the corridor and asked: "Bob, how would you like to go to Lehigh University in Bethlehem?" His first thought was "Boy! It's a long way from home," Bob said. "But my second thought quickly resulted in the practical question 'What kind of school is it?" "That sounds great! What's the deal?" Bob asked. "All tuition fees will be paid by Lehigh plus a 3-11 p.m. job in the Bethlehem Steel plant after football season," was his coach's response. "You'll start practice in late August and go right on the Lehigh Varsity team. The first two games scheduled are Yale and Penn State." Bob's thoughts were directed towards amazement as he grasped the thought of being a high school senior starting right onto a college varsity team facing opponents such as Yale and Penn State he said. With his excitement and disbelief set aside, there was still another big question to be answered; where would he be living? The response was a simple one. "In a fraternity house... Lambda Chi, off campus," his coach explained. And so it was set, that as a young freshman, Bob would attend Lehigh University to play football and become a brother of Lambda Chi Alpha in the three story colonial house on Delaware Avenue. Now, nearly 70 years later, Bob still replays fond memories of his time as a Lambda Chi. "Lambda Chi gave me the help in my college education that made my freshman year both successful and memorable," Bob said. 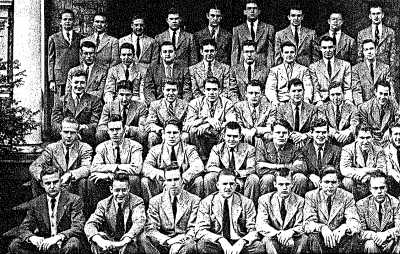 "In addition, I am appreciative to all the guys on the steps in the Lambda Chi photo that was taken in 1942-43. These are the guys I lived with, laughed with, studied with, even cried with at times, enjoyed playing the piano and singing with even though I could only provide the musical chords." Bob's time as a Lambda Chi was cut short due to WWII, but he was able to face his future with the help of his Lambda Chi brothers. "I really feel it was that 11 month experience at 515 Delaware Avenue that gave me the strength to move on when I left in 1943 for the unknown future that awaited me in WWII," said Bob. "Thanks Lambda Chi for being there; I was very fortunate to have found you at a very important moment in my life." Although he was there for less than a year, Bob learned several important things that helped prepare him for not only WWII, but in other aspects of his future as well he said. "The camaraderie among members, observing their dedication towards their studies and goals, the friendship they had for each other helped me when the circumstances of the war sent shock waves through my education plans," Bob said. In late June of 1943, Bob left his college career at Lehigh University and enlisted in the military to fight in WWII. "My orders were to report to MIT in Cambridge, MA....just across the Charles River from Boston," he said. "I was to report to a Navy V-12 Engineering Officer training program at MIT." "After failing an MIT math exam and learning I had "prism divergence" my dream of becoming a Navy pilot was over. However, I still had one opportunity left....to fly as a flight engineer/gunner. So I pursued that route," he said, "first as an aviation machinist mate, then trained 50 caliber machine gunner, then as a flying boat flight engineer." Overall I spent three years plus three days in WWII Navy and achieved a perfect flying combination: Patrol Bombing Squadron VPB 209, Flight Engineer/Gunner flying in PBMs out of the Galapagos Islands off Ecuador," he said. "Our mission: protection of the Panama Canal from possible invasion by the Japanese." The military, similar to his Lambda Chi days at Lehigh, had a large impact on Bob's life he said. "I had the honor of serving with men, like myself, who had the sole goal of protecting the United States from invasion," he said. "This of course took much discipline and training which throughout my business career served me exceptionally well." Upon his release from the Navy in December of 1945, Bob returned to Lehigh University in January of '46 to finish his education in Science in Industrial Engineering. He was a member of the graduating class of 1949. Since graduating, Bob has become very involved and experienced in the business world. "I am happy to say that I've had business experiences with The Mobil Oil Corporation, Behr-Manning Corporation, a division of the Norton Company followed by a very successful career for twenty-five years with The IBM Corporation," he said. Although he has been back to Lehigh several times for football games, Bob said aside from driving by to view Lambda Chi on Delaware Avenue, he has not stopped by to visit. Bob also said, unfortunately, due to the war all his Lambda Chi brothers were scattered, making it practically impossible to keep in touch. Now retired from the business world, Bob is occupying his time with several hobbies. "Writing plays is a big part of my retirement days," he said. "I am happy to say that I've had several articles published in the Melrose Mirror, an online website created by seniors in my home town of Melrose, MA." "My wife and I are also great animal lovers and work with our local Heritage Humane Society here in Williamsburg," he added. Bob leaves one piece of advice for current brothers, "Enjoy the relationships that you make while at Lambda Chi; enjoy the fun too! They will serve you well as the years go by." Although his time as a Lambda Chi was short lived, it made a lasting impact on Bob's life. "August 1942 to June 1943 was one of the most memorable experiences in my lifetime," he said. Click here to see more photos of Bob.